What are my rights if I break my arm because of a bad deck? 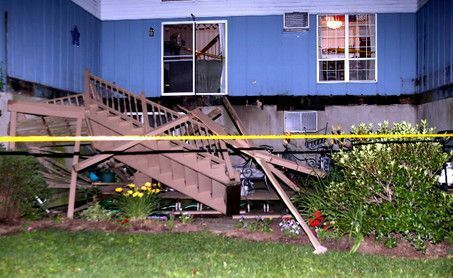 On Sunday night, August 21st, three adults and one minor were injured when a deck collapsed in Dekalb County. At about 4:30 in the afternoon the deck of a house located on Chimney House Court fell inward as a family was gathering. The individuals who were standing on the deck slid down as the deck collapsed and landed against the house. The victims injuries were reported to range from scrapes and cuts to broken bones. Fire Officers responded to the call and said that while there were injuries, the victims were lucky because the accident could have been a lot worse. Officials believed that the collapse could have been due to wear, rotting wood, or possibly termite damage. In Georgia, where the landlord is notified of defective premises and he undertakes to repair the same, he must properly repair such premises, and he will be liable in a proper case for his negligence in repairing the same.